Who is Steph to think she can do this? When I was 8 years old my dad put me on my first ride…a Rally Red 4 HP Rupp Roadster mini-bike. I loved that bike! I later painted the gas tank bright yellow because yellow was prettier. 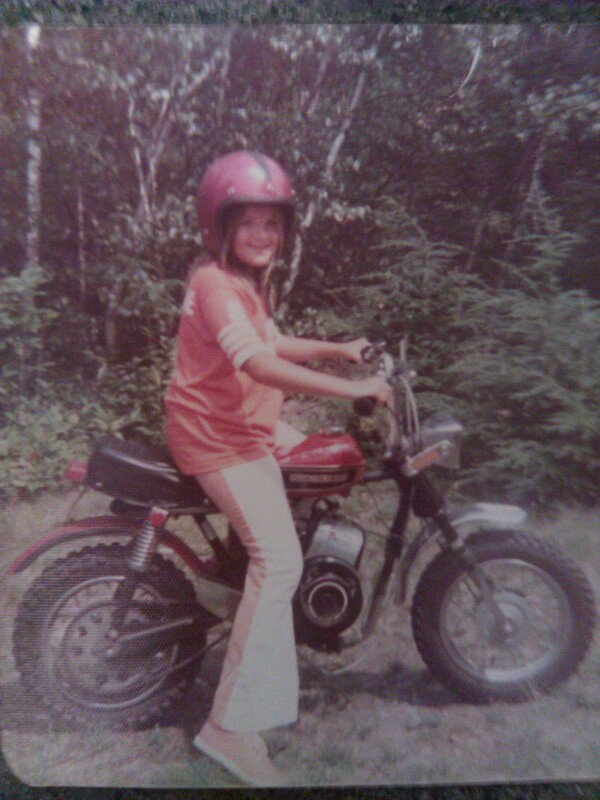 Steph and her Rupp minibike 1973. A couple years later I graduated to a teal blue Suzuki TS 50 at 4.9HP. I’d explore the trails behind my house in central Massachusetts for hours on end – climbing sand hills, splashing through puddles, and speeding down the straight single-track paths. Often I’d ride with my daredevil older brother. On Sunday’s we’d stop at Gert & Al’s, one of our town’s two gas stations to fuel up, buy a 50¢ plastic wrapped ham and cheese grinder from the vending machine, pop it in the industrial sized microwave, and turn the dial. As I waited for lunch to heat up I’d put 35¢ on the counter for my mother’s Virginia Slims. It was small town USA in the mid 70s – not uncommon to send your 10-year old out to buy your butts. With the smell of gasoline and melted sandwich fresh on my Levi’s jacket I’d speed off into the woods towards home, attempting hopelessly to keep up with my big brother. I tried. At 10 it didn’t occur to me to not try. At 11 I sold my Suzuki 50 for $70 and bought a turntable stereo at Sears. Time to move on. And then there I was 30 years later riding a camel in the Sahara desert in Morocco with my daughters and husband. At one point on our 3-day journey four motorcycles flew past us. We seemed so far from any village and I couldn’t imagine where they came from. I knew they were doing something extraordinary, and fun as hell. In that moment I had this burst of sensation in my belly…you know, the feeling you get when your gut knows before your brain that you want to do something. That year we traveled 28 countries and experienced all sorts of crazy modes of transportation. Half the fun was getting to our destination…especially the places off the beaten path, with few people and hardly any cars. Whenever I saw someone traveling on an adventure bike loaded with panniers, duffles, and fuel bottles I knew I wanted to experience that way of travel in my future and go where ordinary cars couldn’t. How that would happen for me I could not imagine. I knew I would do it eventually, and I wasn’t in a rush. Fast-forward 10 years to April 2013 – negotiating a mid-life crisis; sending two daughters off to college; single for the first time in 25 years – and reunited with that long ago desire to have a motorcycle. With a tiny bit of research and an enormous leap of faith I buy my first bike since the Suzuki 50; a 2010 mint- condition 800 cc twin-cylinder BMW F650 GS. I bought it with the intention of taking it on a long trip of which some would be off-road. Buying this motorcycle felt right, and it scared the crap out of me. I was afraid of it. I didn’t know when or how I would get to the point of setting out on a long trip, but I simply trusted it would happen. Did I tell you that the bike scared the crap out of me? I had my friend, a guy with 20 + years of riding experience ride it back from where I bought it because I was scared to death of having to ride it on the freeway back to Seattle. 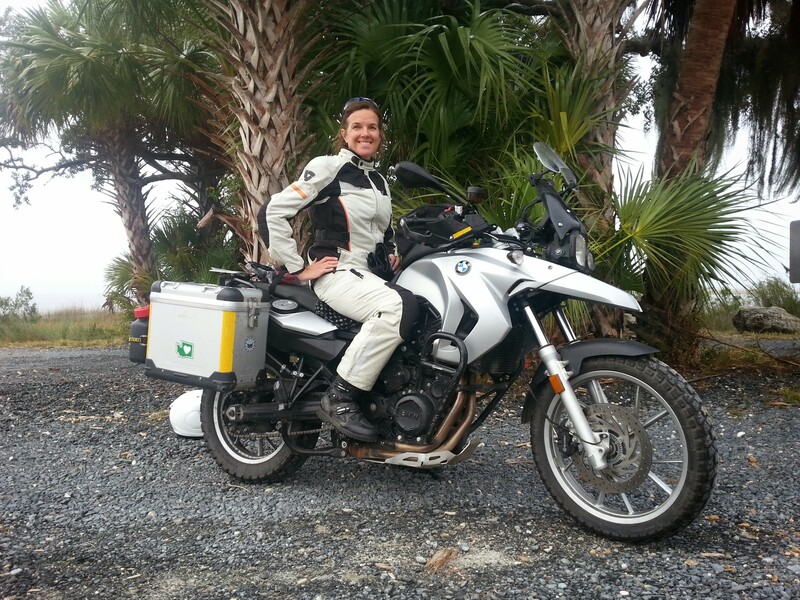 In May, less than a month after I bought the sparkly beemer I spontaneously and with great faith signed myself up for PSSOR’s Adventure Riders Camp to take place a month later. My original plan was to get a year of riding experience before going to ADV camp. So much for that plan. And yeah, I was in over my head. But I went for it. Miraculously, or not, I learned how to ride my 500 lb. motorcycle over rocks and logs, through sand, muddy ruts, chunky gravel, and even some single track among the trees. With the moral support of my fellow campers and excellent technical instruction I approached my fears. In order to learn these skills I had to go way out of my comfort zone and trust my instructors, my bike, and myself. And when I was just too afraid to trust I’d just go cry in the port-o-potty. Seriously. I cried three times that weekend…out of frustration and fear. I dumped my bike a few times, acquired its first scratches, yelled at one of my instructors, and made several lasting friendships. Prior to that weekend I had no idea that adventure riding events existed, not to mention an entire thriving industry! I put myself up on Facebook and immediately had myself a community of female riders (The Dirty Girls) who shared my interest. I became a Dirty Girl and started attending group rides and weekend events. During one event, a 24-hour dirt bike race for which I participated in a support role for our all-womens team, I came to know one of the competitors on our team. After feeling some sparks between us I boldly asked her out. She said yes! and exactly one year after ADV Camp we left Seattle and rode up to Alaska, over to Maine and down to Key West. The journey took a pleasantly unexpected turn and we decided to return to Maine to house and dog sit for the winter. We’ll resume our moto adventure in the spring with our biggest and most grueling challenge to date. As I see it, when we act on these moments of inspiration whether immediately or years later, there’s something in us that comes alive. That first step forward might provide just enough oxygen to fan that tiny spark of inspiration into a vibrant flame. Next PostWho is Shal to think she can do this?